A friend of mine recently came to visit, and she was surprised when my two bunnies hopped over to greet us as we entered their room. She said she didn’t know rabbits even liked being petted. Her remarks made me realize that a lot of people are unaware that bunnies can have quite affectionate personalities – and that a strong bond between rabbit and owner can be established. In truth, rabbits are very expressive. When they’re happy and full of energy, they’ll zip around the room in little bunny blurs, every so often interjecting a few binkies into the circuit. When they’re hungry, they’ll beg for food or get cranky and start chewing the molding and furniture. When they want attention, they’ll dig on your back or your leg until you stop what you’re doing and pet them. And if they think you’re in the way, they’ll let you know by nudging you forcefully with their nose (and they’ll follow up with a little nip if you ignore them). 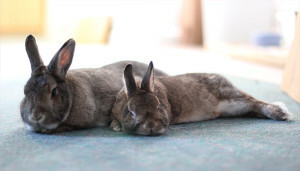 Understanding rabbits’ unique language is helpful when building a bond with your pet rabbit for the long term. 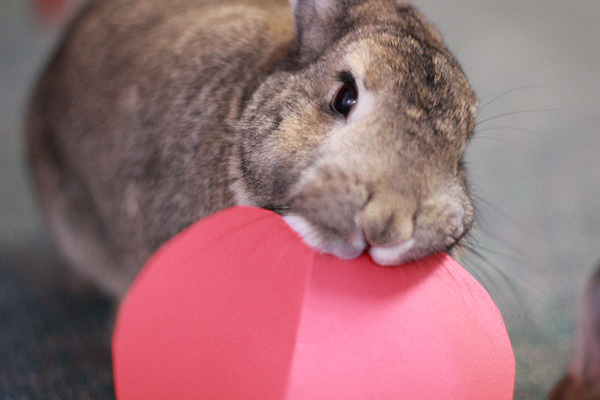 But if you’ve recently adopted your bunny, you may not even know how to start the bonding process. Rabbits are most comfortable on the ground. So your rabbit may not appreciate being picked up and held. If you insist on scooping up little Bunnikins all the time, you may find she starts running away from you and hiding every time you come near. If this is the case, try simply sitting quietly on the floor. Let her approach you on her own terms. When she does, you can gently pet her. My rabbits like being stroked on their forehead and cheeks. They put their head on the ground and close their eyes in contentment. They also love getting a good back scratch around the shoulders. That said, they tend not to like being touched on the ears, neck, feet, stomach or tail. Usually, my bunnies are most receptive to petting when they’re relaxing after a meal. So if your rabbit doesn’t appear interested in affection, wait until just after feeding time. Rabbits are very curious animals, so your bun may just be distracted by all the potential mischief to be had. Bunnies have very distinct personalities. With time and patience, you will learn what makes your bunny happy. And in return, your bunny will come to trust and appreciate you.